Bio: A clanking, crushing terror that destroys all in his path -- the ulimate Decepticon weapon if he wasn't so confused by the opposing thoughts of the 5 Stunticons who comprise him. (Motormaster is loathed by the other four.) Tremendous strength, his punch has the force of 140 tons. Impervious to most artillery. Carries an ionizer sword with a 50,000 volt charge. Yay! Got all the Stunticons to make the hulking disaster that is Menasor! To say I am quite excited is an understatement, after all the faffing about trying to get Motormaster and Blackjack. 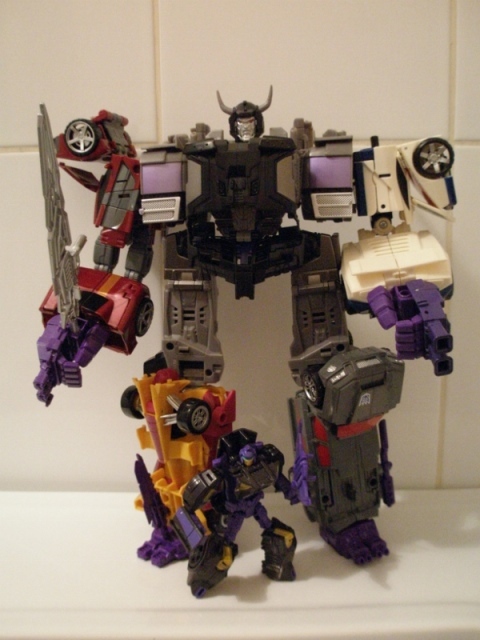 As I may have mentioned before, I love the Stunticons. 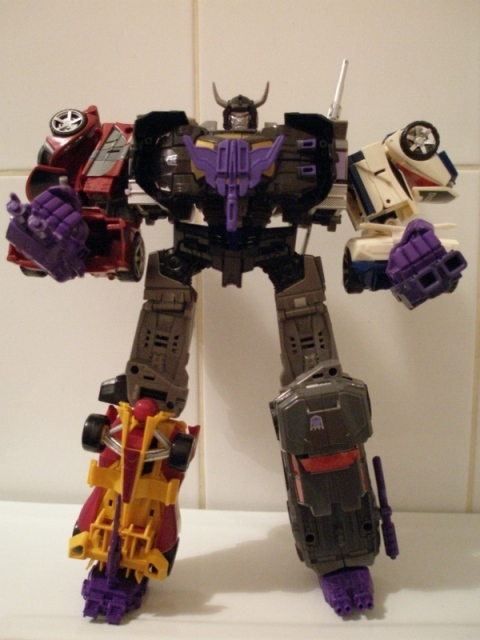 I like the original Menasor toy, the only problem I had with it were with Motormaster's feet being tucked up behind his thighs (better than what Computron ended up with though) and that he was the smallest of the four Special Team giant robots and therefore, less super than his Super Warrior function implied. 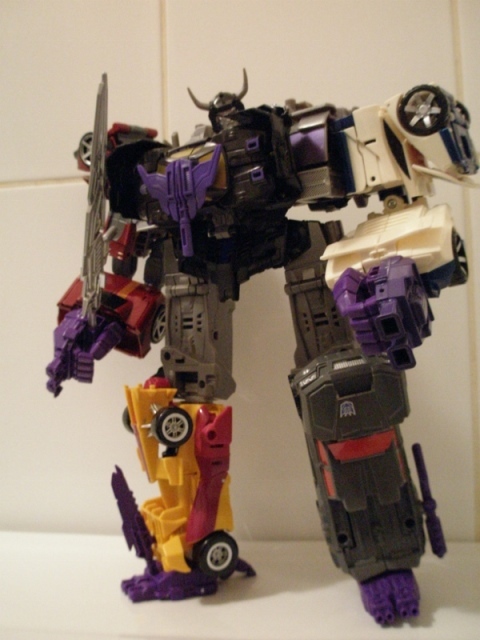 Robot Mode: In his official configuration, Combiner Wars Menasor looks like Slaine after he's warped out. All squat, tiny torso and little bobble head and ginormous mal-formed limbs. 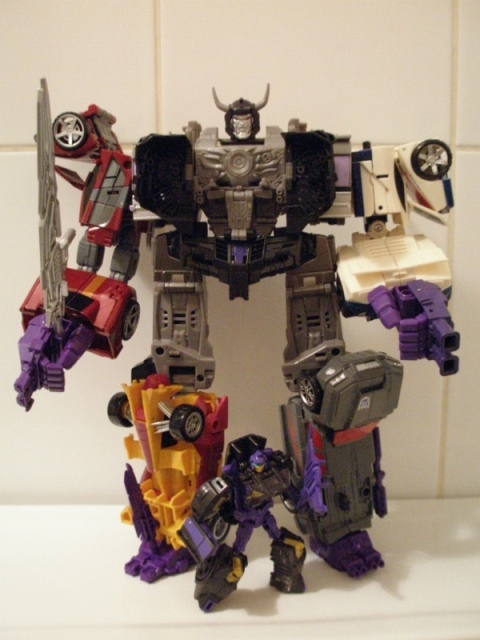 The fat, sleek cars that comprise Menasor give him horrible bloated proportions in robot mode that don't work so well as they did on the original toy. Not helped, it has to be said by the huge hands and tiny feet, which make him look like some terrible victim of elephantits. Or a fatty wearing ill-fitting clothes. I've found fiddling about with his hips sort of helps, but he still has the problem of then looking like Lola Ferrari. Can't say as I'm fond of the gap between his head and his chest. His head sits on a rotating panel that has a good 3mm of clearance over his shoulders, giving him an uncomfortable looking gap where his neck should be. I'm in two minds about the addition of Blackjack to his chest too. The closed up truck cab actually looks a lot cleaner and tidier than the opened kitchen cupboard of his chest you get by clamping Blackjack on there. His overall look is in no way helped by the elaborate toothpick he carries about. 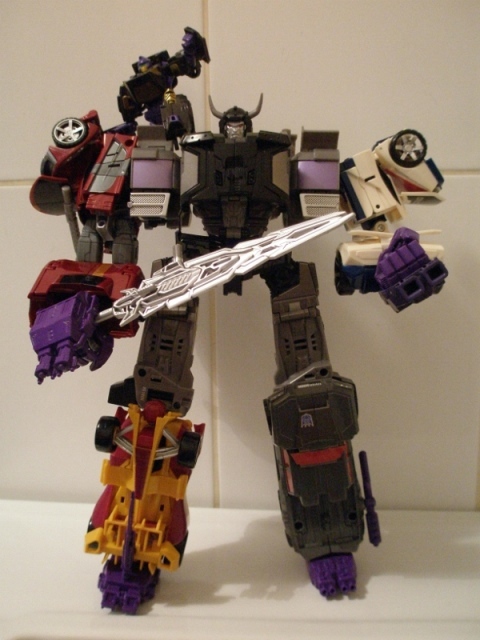 In any other toy's hand, the sword would look totes amazeballs, but here Menasor holds it slightly apologetically, and it doesn't look a good fit for the blobby, blocky nonsense of his frame.